Why Stay In An Irish Castle? When people think of Ireland they all seem to default to the same two thoughts: Guinness and green landscapes. In a country simply bursting with history, beauty and culture; most travelers seem to only scrape the surface of what Ireland offers. On your visit to Ireland, rather than book a room above a noisy pub, why not step back in time and stay in an Irish Castle and be Lord or Lady of the Mannor during your stay here. What Your Luxury Castle Visit Will Involve. Ireland is home to many castles, some of which have been converted to hotels to allow guests to tap into the country’s rich history. Castles in Ireland are renowned the world over for their warm Irish welcome and idyllic Irish surroundings, which when combined with stately luxury and superb cuisine, will make your stay in Ireland an unforgettable vacation experience and one you're going to be bursting to tell your friends about! 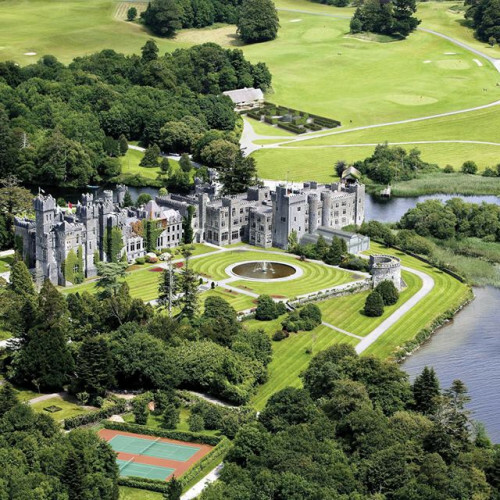 Ashford Castle is one such castle that dates back to 1172 and is conveniently located just 10 minutes outside Dublin. Clontarf is the perfect juxtaposition of old and modern: a mix of Irish history located just minutes from the modernity of the country’s capital city. Just make sure that when leaving the pub and telling your taxi driver to take you to your castle, that they know it’s not the Guinness talking. Just 10 minutes out of Dublin, so you don't have to get lost deep in the countryside to experience such magnificence.